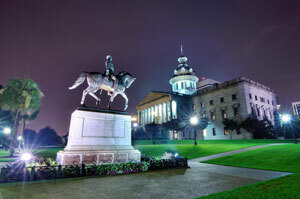 Columbia, state capital of South Carolina, is home to over 130,000 people and is known as “The Capital of Southern Hospitality.” Columbia has a very large college community with notable universities like the University of South Carolina within its borders. This creates a very large market available to target your audience with effective outdoor advertising. There are also many shopping centers in Columbia where out-of-home advertisements can expose your business. Mall advertisements in Columbiana Centre and Columbia Place are examples. The major highways running through Columbia are can also be used as an advertising strategy. Billboards on I-26, I-20, or I-77 would yield high traffic exposure of your business. Zip Codes: 29201, 29202, 29203, 29204, 29205, 29206, 29207, 29208, 29209, 29210, 29211, 29212, 29214, 29215, 29216, 29217, 29218, 29219, 29220, 29221, 29222, 29223, 29224, 29225, 29226, 29227, 29228, 29229, 29230, 29240, 29250, 29260, 29290, 29292.